Kuala Lumpur’s high levels of general friendliness which facilitates expatriates in getting settled and enjoying a great work life placed the city fourth out of 51 cities in the Expat City Ranking 2017. 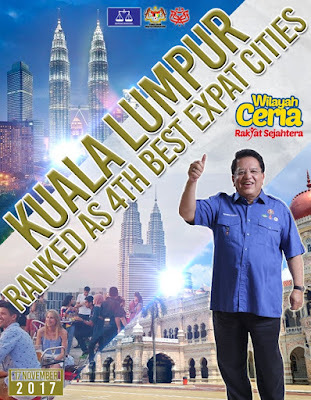 Kuala Lumpur joins Manama (1), Prague (2), Madrid (3), Amsterdam (5), Barcelona (6), Johannesburg (7), Bangkok (8), Basel (9), and Frankfurt am Main (10) in the top 10 list, according to a press release today. The majority of expats rates the general friendliness towards foreign residents positively in Manama (84%), Amsterdam (83%), Kuala Lumpur (78%), and Madrid (74%), compared with a global average of 67%. “The small capital of the Arab monarchy Bahrain, as well as top-ranking Madrid and Kuala Lumpur, are highly appreciated for the ease of getting settled in these cities,” the statement read. A South African expat living in Kuala Lumpur enjoyed “the easy-going temperament and friendliness of the local people” while a Filipino expat liked the “very friendly and helpful locals” in Manama, the survey revealed. Prague tended to attract expats with its excellent work life, while Amsterdam manages to offer a good mixture of both work life and ease of moving into the city. The rankings are based on data collected in the annual Expat Insider survey, which is conducted by InterNations, a global network and information site. The survey involved about 13,000 expatriates representing 166 nationalities and living in 188 countries or territories to provide information on various aspects of expat life. This year, which is the fourth year the survey was conducted, respondents were also invited to share their opinions on their current resident city. Apart from offering an in-depth analysis of expat life in 51 cities, the survey ranks them by a variety of factors from the areas quality of urban living, getting settled, urban work life, as well as finance and housing. lohhhh Jakarta kok enggak ada ya dalem senarai...? ?